But hey, whatever works for you. The Fiat 500L really does have a love-it or hate-it design, and this is something the automaker hopes to positively change with this mid-life refresh. The 2018 Fiat 500L, which needs to improve its predecessor’s spotty reliability record, features 40 percent new components along with more aggressive styling as well as a new "off-road" trim, the Cross, and optional seven-seat versions, called the Wagon and Urban. More than likely, the latter will be for Europe only. So, what’s new with the US-spec 500L? The front end styling is less quirky, with a more upright appearance. LED accent lighting has also been added. The rear end is also more aggressive, with new chrome accents on the bottom of the bumper. There’s a total of 37 color combinations, according to Fiat, taking into account the roof and body. Step inside and we’ll see a new steering wheel, dashboard design and the latest version of FCA’s Uconnect infotainment system. The speedometer and tachometer are held within a 3.5-inch color display. As for the 500L Cross, it’s raised by 25 mm and features skid plates, new wheels and tires, and more "outdoorsy" front and rear bumpers. What wasn’t mentioned, however, is whether or not the 500L Cross will offer AWD. As for the 500L Wagon and Urban, those seven-passenger (instead of five) wouldn’t make much sense in the US, whereas they’re a better fit for Europe. 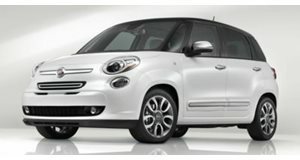 Heck, the current 500L has never been a strong seller in the US, and it’ll be interesting whether or not this changes.